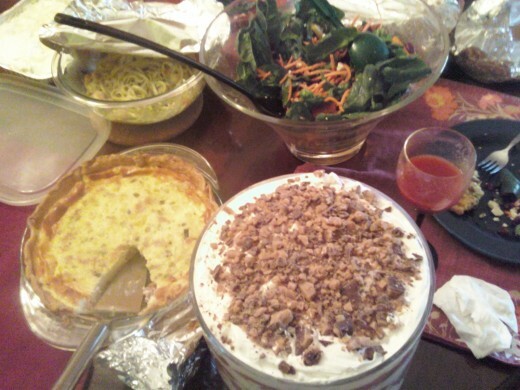 A sampling of the dishes at the Potluck- shrimp scampi, a salad, a quiche and a a trifle for dessert. Hosting a Potluck is a great way to get together with friends for several reasons. For the group I am hosting, we've known each other since elementary school. As the years go on schedules get more complex, making it difficult to coordinate for all six of us to see each other at the same time. When we do get together, the focus is catching up on everything- work, relationships, family, gossip, and if there is time- our shared love of pop culture. At this point in our early 30s it is no longer important to us to go out to a trendy, expensive restaurant, where we can’t even hear each other talk and spend 3x the money on beverages we could have got at the liquor store and made ourselves. Potlucks are a great way to see home improvements at each other’s places as well a nice way to try out new recipes. 1. Select a host(ess)- As the hostess for our Potluck I opted to make more dishes than everyone else as well as beverages since those can be difficult to transport. 2. Discuss and choose a theme-We decided to set a ‘Good vs. Evil’ theme, pulled from Top Chef. A theme like this may sound tricky but you can go in several different directions- good can equal healthy while evil can be unhealthy (but delicious), spicy, hot dishes often take on an evil connation, while angel food cake, devil’s food cake, and deviled eggs work in the theme as well. Other themes to consider are ethnicity-based- Mexican food, Chinese food, or American food. 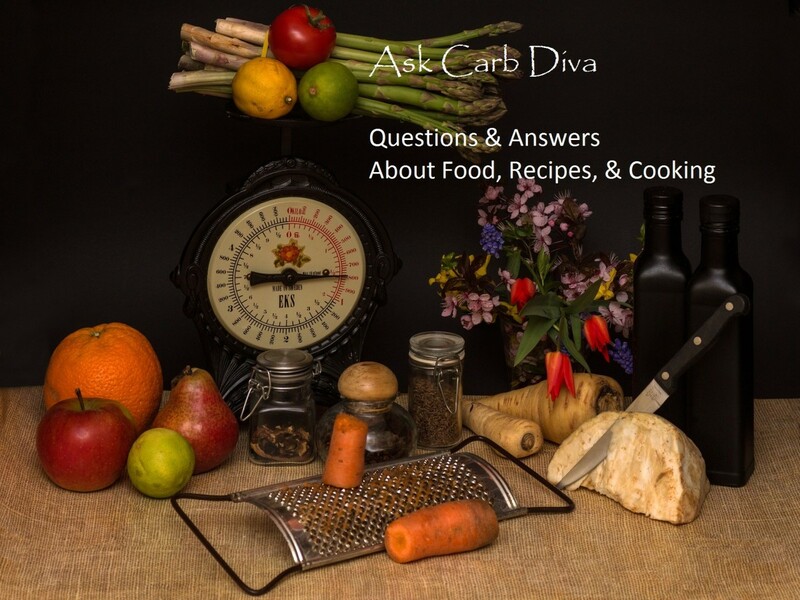 Other suggestions are holiday-based, breakfast, or recipes all involving one key ingredient a la Iron Chef. 3. 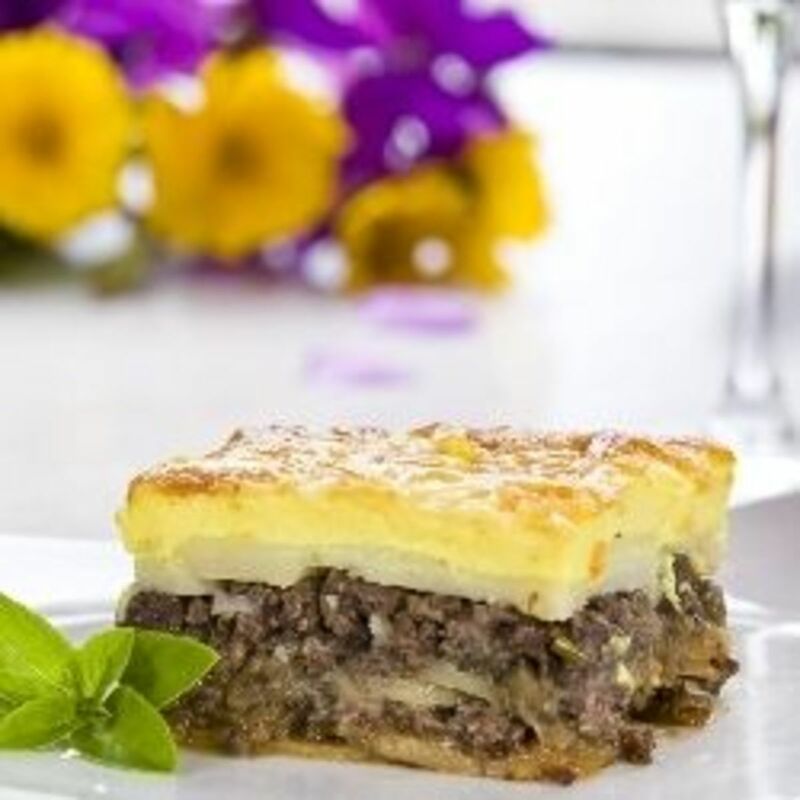 Coordinate who is bringing which dish(es)- Have a general discussion of who is bringing what in order to ensure you have a variety of appetizers, main dishes, desserts, and drinks. We decided everyone would make two things from different categories. As to the exact recipes and ingredients we left that to be a surprise for the day of the event. As hostess I made a main dish, Shrimp Scampi- two ways, two desserts, and two alcoholic beverages. For both the main dish and the desserts I made small portions. I made a healthy version of shrimp scampi and a not so-healthy version. I got enough ingredients to make one full dish and then split them to make two smaller dishes. For the not so-healthy version I made a spicy, creamy sauce. And for dessert I made two small batches of homemade ice cream, Wasabi and Beer. I felt this went with the overall theme as in Are they good or evil? Lastly for drinks I decided to go with Bellinis and Bloody Marys because I felt they go with a Sunday meal and seem to work within the theme as well. My beer options for the beer-flavored ice cream. I went with the Sam Adams Boston Lager. After 15-20 minutes mixing, the ice cream has thickened up to the right consistency and is ready to go in the freezer. Ingredients for the Wasabi-flavored Ice Cream. 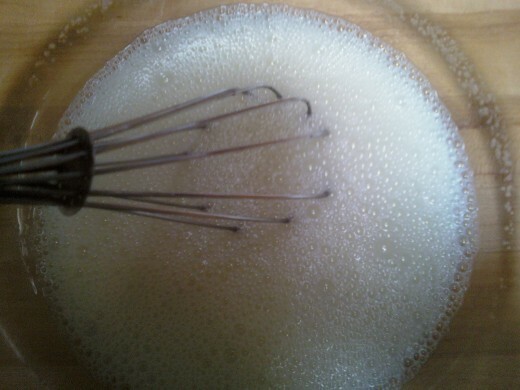 Mixing the milk and sugar with a whisk for two minutes. First up, I made the ice cream. 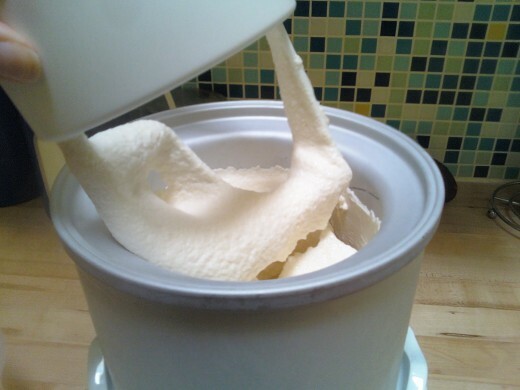 I started with the basic Vanilla Ice Cream Recipe with the Cuisinart Ice Cream Maker. For my varieties on this, I look quick on the internet for guidelines and then wing it a bit. The good thing about making ice cream is as long as you have the core elements- it will usually taste good even if you experiment a bit. For the beer flavored ice cream, I noticed two trends online with the various recipes I saw- for one you substitute out the milk for the beer, and two it seemed an equal ratio of heavy cream to beer is the norm. 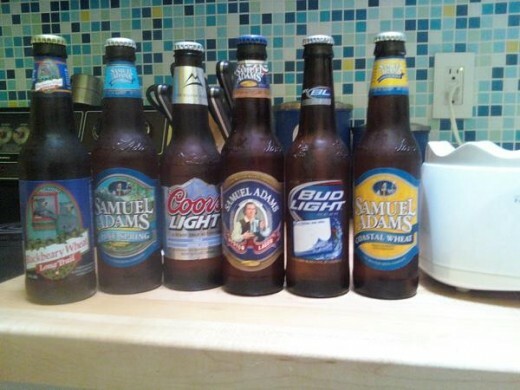 I took a look at our motley crew of leftover beers from various get-togethers and poker games and pictured to the right were my options. I think in the future using a microbrew cream stout or something with chocolate or coffee undertones would make a delicious ice cream but for the first time out I figured I’d use what I have. I went with the Sam Adams Boston Lager, when poured into the measuring cup it was just about 2 cups which was perfect since my base recipe calls for 2 cups of heavy cream. 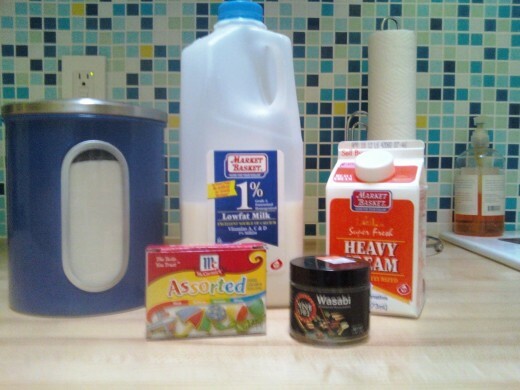 Normally you whisk the milk and sugar together for two minutes until smooth, then add the heavy cream to the bowl. Since I was subbing in the beer for the milk, I decided to add a little beer to the sugar, then a little of the heavy cream and so on until all three were mixed. Then it goes into the Cuisinart bowl, which needs to be in the freezer for a full 24 hours before use. When making multiple batches of ice cream, this is the only tricky part- you can only make one batch a day, so you need to plan ahead. The bowl needs to be totally frozen for each batch, otherwise the ice cream while not thicken up properly while mixing. Speaking of the machine, it is four parts- the base which has the motor, the bowl, a mixing arm, and the locking lid- which locks the mixer in place. The ice cream mix goes into the pre-frozen bowl and the machine runs for about 15-20 minutes. 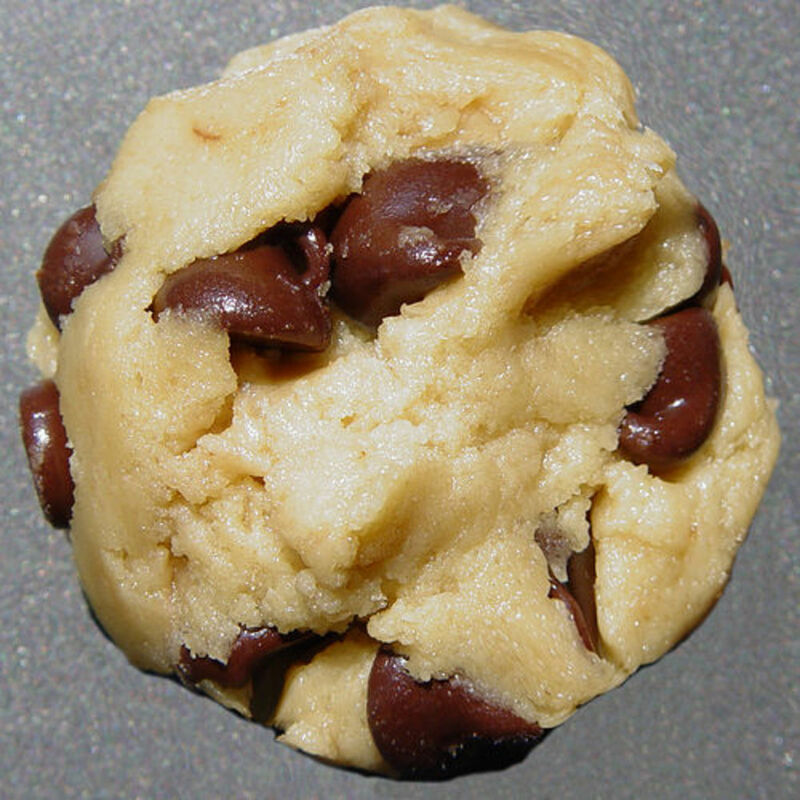 If making something with chocolate chips or cookie bits, they are added to the mixer in the final minutes. Once the time is up I pour the thickened ice cream into Tupperware containers and freeze for at least a few hours before eating. Whisk 1 cup of cold milk into ¾ cup of sugar. 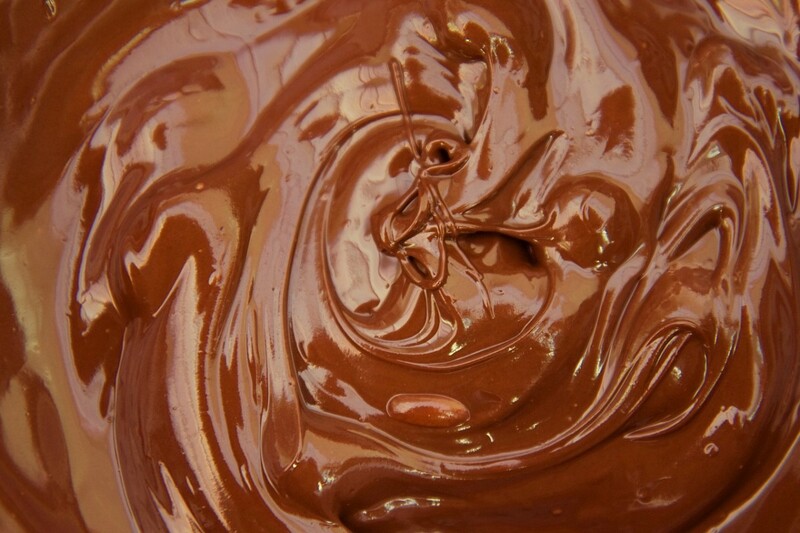 Whisk mixture for 2 minutes. Whisk in the 2 cups of heavy cream and 1-2 teaspoons of vanilla extract (to taste). Add to frozen ice cream bowl for 15 to 20 minutes. For the wasabi-flavored ice cream, which I made the next day after the bowl was frozen again for 24 hours, I stuck to the basic recipe- 1 cup of milk (whole milk tastes great but the ice cream will still taste creamy if you use 1 or 2% or even lactose-free milk), ¾ cup of sugar, and 2 cups of heavy cream. Again based on a quick internet search, I found recipes using a few teaspoons of wasabi, and for the full effect I added a few drops of green food coloring. I was a little cautious with the wasabi, but found it didn't pack a really big punch when I taste-tested it. When I make it in the future I will add another teaspoon of wasabi powder. For the record, the beer flavored taste test was really good. 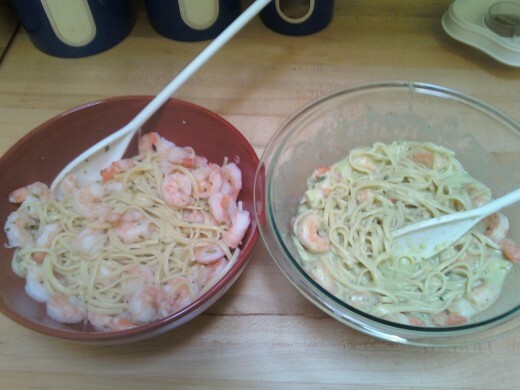 Shrimp scampi made two ways- a healthier version as 'Good' and a 'Evil' version with a spicy, creamy sauce. 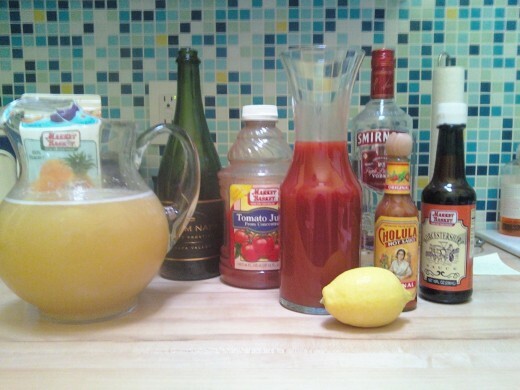 Bellinis and Bloody Marys and their ingredients. On the day of the Potluck- I put together my main dish- two ways, tradional shrimp scampi and a scampi with a poblano-cream sauce. Both recipes appears in the March 2012 EveryDay with Rachael Ray- but I made some subsitutions to the poblano sauce based on what I could find in the supermarket and what I had on hand. As the host I think it's best to make things ahead if you can, since you will be tidying up and preparing for guests the day of the potluck. 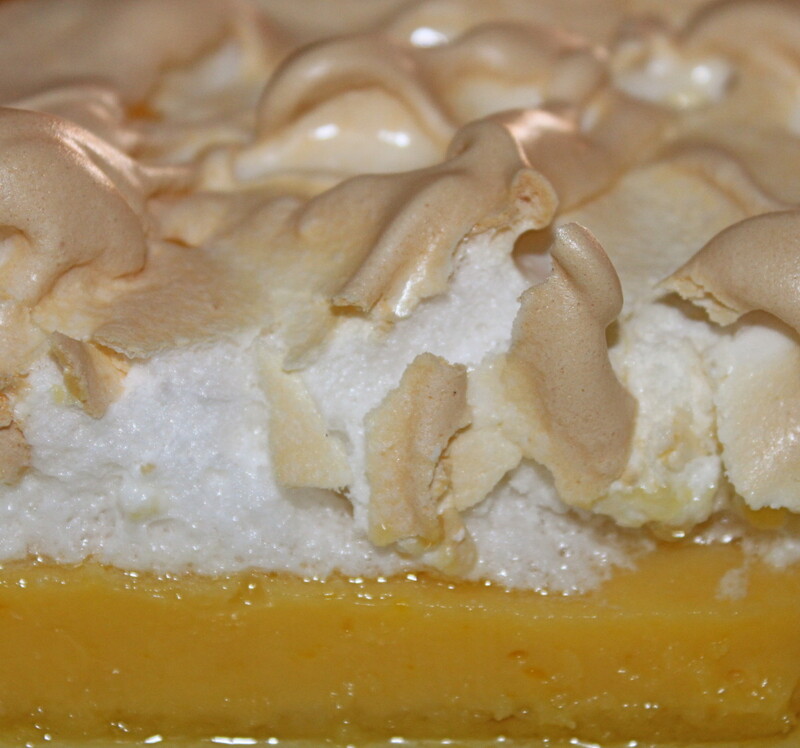 I picked a dessert that I could make several days ahead, while my main dish was pretty simple to make on the actual day. Another tip for hosting a potluck is to ask your guests to bring empty tupperware with them so everyone can take home leftovers of all the dishes. In the end, our Good vs. Evil Potluck turned out great- we had a good variety of courses based on our pre-planning: spinach and artichoke dip, bacon wrapped asparagus, and a salad to start; then two types of quiches and shrimp scampi two ways for entrees, then an 'evil' trifle and a 'good' low fat pineapple dessert and my interesting flavored ice creams. In the end we spent less money than if we went out and we all ended up with leftovers from each other's dishes to bring home for an additional meal or two. And of course the conversation was great, we got to sit around, eat, and chat all afternoon. Thanks for stopping by and commenting, L.L. Woodard- Potlucks are great to fill the gaps between the traditional holidays and celebrations. phdast7- thanks for commenting, they are a great way to sample recipes one might never try on their own. The beer and wasabi ice cream definitely isn't for everyone, but those that were interested did like it! Thanks for stopping by Thelma-that is definitely another positive for potlucks-sharing the responsibility! Potlucks are great idea when bonding with friends. So you don't have to cook all the foods for the gathering. Thanks for sharing. Voted up and useful. I think potlucks are one of the more enjoyable ways to get a group of any people together. There aren't many gatherings in life that don't include food and/or beverage -- it's just a fact of life! You've included a variety of ideas here. Until watching an episode of "Shark Tank," I had never heard of beer ice cream and here you've explained how to make it at home.